Kamen Rider EX-AID - Episode 19-21 Titles & Summary Plus Hiiro To Transform Into EX-AID? With his Taddle Quest Gashat at the hands of Genm and Emu having a Bugster inside of him, will Hiiro be able to transform into Kamen Rider EX-Aid? Check-out the answers below after reading the titles and summaries for the rest of the February episodes for Kamen Rider EX-Aid! Episode 19 "Sudden Fantasy" (2-19-17) - With a Bugster inside Emu's body, Hiiro, Haima and Asuna plans on how to stop the infection from spreading in his body while Dan continues his plan to collect data in order to complete his newest game, Kamen Rider Chronicle. 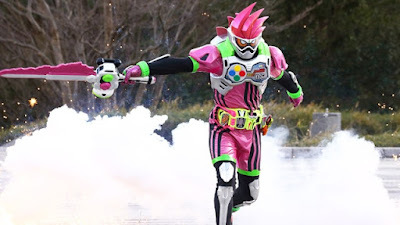 Kamen Rider Brave Fantasy Gamer Level 50 will debut in this episode but before that, as we can see from the images above, Hiiro will temporarily use the Mighty Action X Gashat to transform into EX-Aid. Episode 20 "Take-off from headwind" (2-26-17) - Taiga and Nico will meet a high school student named Daisuke who is infected with a Bugster Virus and calls both Emu and Hiiro for their help. Parad suddenly appears and Hiiro will face him in his new form while Emu hesitates if he will join the fight. Kamen Rider Snipe Simulation Gamer Level 50 will debut in this episode. Episode 21 "Catch the mystery" (3-5-17) - No summaries have been handed out yet.